I think everyone that has followed this site for a while probably knows that I waaaaaay married up. My wife Coral has been my best friend since we were in high school (yes we are high school sweethearts…I know, very touching). Somehow, she isn't tired of me yet and puts up with my ridiculousness on a daily basis. As many good things as there are that I can say about our relationship, I think one of the things that I'm most proud of is that we don't fight about money. Ever. I can't think of a single argument we've ever had about money, even when we were super super broke in college. Unfortunately, it's not that way for a lot of couples out there. One of the most common questions I get from M$M readers is about figuring out how to communicate with their spouse about money. In fact, one-third of couples say they get into arguments about money every month (those fights are also the leading cause of divorce). I think the biggest key to finding a good balance with money as a couple is to be really open and honest about what you're not very good at and where you excel. Believe it or not, I have a horrific memory. Some days I'm honestly surprised that I've been able to create and run this business as well as I have. My wife, on the other hand, has a ridiculously good memory and is also much more organized/type A than I am. That's why she actually handles most of the recurring monthly expenses that we have like rent, our cell phone bill, etc. With her handling that aspect of our finances, it allows me to focus on the stuff that I know I'm pretty effective with (like running the business and nerding out about Personal Capital). So basically, it comes down to this: Don't feel like you have to split financial responsibilities 50/50 just because you're married. Try to find what you're both great at, and then go forward from there instead. Obviously, to make a system work like the one I described above, there has to be a lot of trust involved. I don't look over my wife's shoulder to make sure that she does everything she needs to, and vice versa. Instead, we just talk about things as often as we can, which builds trust that we're both going to do what we need to do. This may be overkill (and mostly due to the fact that I'm a personal finance blogger by trade), but my wife and I talk about our finances daily. It's not formal or anything like that – it's usually over dinner or in the car if we're driving somewhere. Typically it's just a rundown of expenses that we have coming up, big wins for the business or her job, and just talking about cool things that we want to save up for like a vacation or furniture for our new house. Those mini-conversations are the main reason we are able to run our finances so smoothly every month. Basically, communication = trust. It's really not a complicated formula. I see people in denial about this all the time, and in my opinion, it just puts a weird strain on your relationship that doesn't need to be there. Well…sorry to break it to you Steve and Marge. Once you put a ring on it, you both own it. If you're married, your assets are legally shared 50/50. You're welcome to think of it as “your money” or “their money” if it helps to keep you organized, but that doesn't change the reality of your finances at all. Getting out of denial with debt helps you get rid of it faster and get onto the more awesome things like guilt-free vacations and extra money in your retirement accounts. Related: Should You Travel if You Have Debt? It's not just about debt though; this same concept also applies to income. In our relationship, I make quite a bit more money right now. However, I NEVER talk about it like it's just mine. It's both of ours, and that's the agreement that we made when we got married. We enjoy the money together, and truth be told, if my wife hadn't supported us when I quit my job to run this business…we wouldn't have nearly as much. I also have zero right to hold my income over my wife's head or have a bigger say in where the money goes. We both have equal access to all of our various financial accounts, and it will always stay that way. For young couples like us, this is probably the hardest thing to combat financially. We have so many friends and family around us that think we should have kids by now or drive nicer cars. If I had a dollar for every time someone has told me that pregnancy gets harder after 30, I'd fold this site up like a cheap lawn chair and move to Florida. Related: “Why Don't You Have a Kid Yet?” – Everyone. The reality is this – if we spent any time listening to them about what we should do with our money, we probably wouldn't have any. There's a reason we are so far ahead of the average U.S. household in our twenties. You have to learn as a couple how to ignore the people around you. Unfortunately, that includes the people that you're close with as well. Unless they start paying your bills for you, their opinion just straight-up doesn't matter. It's OK not to buy the newest stuff for your kids. You don't have to wear expensive clothes or drive nice cars just because other people think you should. Yes, you can treat your dog like it's your kid until you're ready to have real ones (or forever if you don't want kids at all). You and your spouse are a team, and you're playing your own game. Don't try to play someone else's. Like this post? Pin it below! If you find yourself in a situation where you're worried about money or not comfortable with your financial strategy, you have to do everything you can to push past that and start talking. 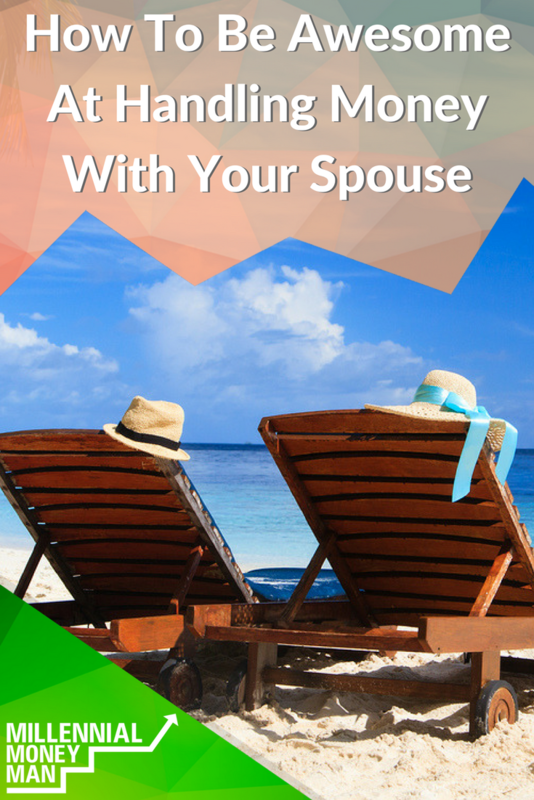 Money doesn't have to be taboo, and it never should come between you and your spouse. It's just not important enough in the grand scheme of life. How do you and your spouse deal with money? Good stuff! Keep hustling, stay faithful and keep creating great content. You guys are like our twinzies. If you ever make it up to MN (or if I’m ever in TX) we need to grab some beers and nerd out over this stuff haha. We also talk about our finances (or goals – and finances play a big part of most of our goals) on a daily basis. In particular right now because we’re building the house it’s just always on our minds. I’m not going to lie, we’ve had our hiccups and fights (like when I lost $400 cash one drunken night – part of the reason I don’t like carrying cash…) but it’s been a long time since the last one, and it was before we started being as open and honest with each other as we are now. For the debt thing: yes, 50/50 split once you’re married is my belief. I know there are proponents of split finances and that’s cool, but ultimately one person’s debt WILL hold you back as a couple, so why not tackle it together? Early on in our relationship, my wife (then-gf) had some CC debt while we were dating and I made her pay it off herself even though I could have taken care of it. Financially it wasn’t the ‘best’ move but at that point in our relationship we hadn’t talked about money much up to then and I wanted to be sure that she was responsible with it. I supported her emotionally and helped her make a plan to tackle it, and she did; ultimately she was happier that I let her take care of it. She needed to feel that sense of equality – because we are equal, regardless of the fact that I also make a significant more than her – and that really helped. I’ve always been and will always be a proponent of open, honest, and frequent communication. Anything other than that can lead to troubling times. Haha for sure we can do that! I don’t really carry cash either because…well…millennial. I’m actually all for the “keep our money separate thing” if it works for you. That part was really just for the people that pretend that the other person’s financial burdens don’t affect them. I manage all of the finances in our household. My husband just prefers it that way as he has no real interest in it. Of course, we discuss our long-term goals and plans. But the day to day bills and expenses are all done by me. And when we first started investing in the property I found the research fun so I managed all of that too. Right now hubby is a stay at home dad and I have also been at home when I was on maternity leave. So I think the “our” approach to money has been essential during this time to stop any resentment. That’s awesome! I actually have found that one person handling the nitty gritty money stuff is really common. Pretty cool. Ha yes if my wife didn’t do the stuff she did, we wouldn’t be anywhere close to where we are right now! It’s frustrating when your spouse won’t communicate about finances and the future. I’ve tried many times to have these money conversations with my husband but he just seems to turn a deaf ear. We are in our 50’s and behind in saving for retirement. All I can do is focus on what I’m saving & hope that my mom is going to leave me a small inheritance, but even that I can’t count on. Ah I’m sorry to hear that! Keep grinding! Yessss. In particular, changing the language you use about finances will help a lot. Going from the “your loans” to “our loans” language makes it more inclusive. When we single out expenses, it makes it seem like it’s your partner’s fault that the expense it there. We also play to our strengths and it’s been successful. I focus on budget-cutting and meal-planning while Mr. Picky Pincher handles all the numbers. Hmm meal planning is still something we need to do a better job of! Very important to work together to pay down debt. We are always coming up with ways to optimize our debt-free financial situation. I always love hearing how other couples manage their money and challenges they face. Me and husband have vastly different viewpoints on money which caused some bumps in the road until we figured out a system that worked for us. He was raised relatively poor and whenever they had money, they spent it, so he is a spender. I was raised by a mom that works for one of the largest mutual fund/retirement planning companies and consistently talked about savings, so I am saver. While I would love to geek out about money with him on a daily basis, I know that would overwhelm him, so instead we have “meetings” at the beginning and middle of the month to check in and see how we are doing financially. Otherwise I handle all of our bills and our savings and then we each have our fun money accounts so he can still be a spender without blowing our entire budget on xbox games. I think this works out well for us because I am happy he is aware where we are financially and helps make the big decisions and he is happy that I don’t criticize every purchase he makes. Okay, thank you for sharing this. These are great things to keep in mind. And frankly, being married in the Christian circle, as a wife I experience #4 a lot. People think that since we don’t have a joint checking account, that our marriage is going to break down (let me pause for an eye roll 🙄🙄🙄). When in reality, my husband accepted me and all my student loan debt, and we have financial goals together centered around supporting each other. We have the power in our “separateness” to step in and help each other and practice trust in finances. Boom. It’s all about being friends and being able to talk. 🙂 no problem! I realized I had never really written about finances and marriage on the site before! You hit some great points in today’s article. With any relationship you want to succeed you need to communicate. My father always taught us growing up that in marriage you need to put in 60% of the work. If you are only doing 50% you are not doing enough. It’s work wonders in our marriage. What are your thoughts on couples that have different spending habits? Say one person is a shopper and likes fancy toys (and they can afford them) while the other is more thrifty. Do you think it is necessary for both people to slightly change their habits/values to decrease tension in the relationship? I think the key is to agree on a plan/limit/budget in advance. If the budget can handle the higher spending of one spouse, then I’d say it’s fine. But if you aren’t both in agreement about that leeway on personal spending, or if it’s derailing your other financial goals, then it’s a problem. To your last question: yes. I would always put the relationship higher in priority than my personal wants (be that “wanting” more money in the bank or “wanting” to spend more on fancy toys). This is a strength area for us as well. I happened to be taking a personal finance class for my master’s degree when we were dating and one of the books was Values-Based Financial Planning by Bill Bachrach. It was an excellent way for us to talk about our financial goals and dreams. That helped us create a spreadsheet that drives our savings and investing goals. Another thing that helped us was staying out of debt. Besides the mortgage I had on the house I had already bought a few years earlier, we had no other debt going into our marriage. We also don’t think of our earned income as mine and hers. I’m a CPA and she’s an infant/toddler teacher, so I FAR out-earn her. But it’s all OUR money, I don’t get any more voting power in our budget than she does. And I am 100% convinced that her presence in her life has been a direct contributor to some of the job changes and pay increases I’ve received along the way. And we communicate. We put a plan in place and budget based on our priorities each month. Another thing that helped us was Dave Ramsey’s Financial Peace University class. I don’t agree with Ramsey 100% on personal finance, but I think his one-size-fits-all message keeps his many listeners from making some stupid debt decisions that their impulses wouldn’t otherwise control. We were doing well at the nuts and bolts of our money, but taking that class helped us work and talk through more of the emotions of money. Her parents do not communicate well about money, so it helped us see some things we want to do differently in our marriage. I really agree with your points on trust and owning it 50/50. My wife and I don’t argue about money partly b/c we each trust each other to spend responsibly and bring up any big purchases we are considering. As for a 50/50 split, once we got married I just thought of it as everything going into one big pot, income, debts, bills, purchases, all in the one money pot we share. Thank you for #3. I’m completely baffled by people who enter a union (ie, marriage) assuming they’re only marrying the good things their partner brings with them. The idea of marriage is to become one, not mostly one. Plus, when a couple works together they can tackle any debts faster and get to building wealth faster. All the young couples on here better listen to this – so much truth in here! Like just about everything in marriage, communication is #1. My wife and I used to get in arguments about money a lot. I’m a natural saver and she’s a natural spender. When we got married, I said that I’d cover the bills and she could use her income to furnish our new house. Whoops. We didn’t talk about what was really important to us and next thing we knew we had a ton of expensive furniture but no money to actually *do* anything together. Eventually we went wholesale on combining finances and shifted to a one-income family. Now, my wife manages most of the day-to-day (bill payments etc) but our budget is a shared process and we work hard to establish shared dreams and save toward them. I agree with you about communication. Communication is the key not only with regards to family finance but in general to the marriage as well. In our case, my wife is very good in budgeting so she handles that part of the finances including payment of utilities. I do take care of our credit cards, all two of them (AMEX and VISA). We share the AMEX card fyi. This setup has been working well for us and that’s because of the trust factor that you also mentioned in your post which is extremely important. This article completely agrees with the way my wife and I go about our finances! I know for a fact the reason we are crushing our student loans is because we are attacking them as a TEAM! Although my salary is much more then my wife’s and her student debt is much larger then mine it makes so much financial sense to attack it together. Thanks for the post Bobby! Another great post, Bobby. It’s a common statistic that finances is a top reason for divorce. It’s not a surprise. Particularly if a couple aren’t open about money. You can’t just wing it and hope it all works out. A lack of planning and communication on the topic seems to hint at some other issues about maturity or worse. Also, keep up your fortitude about the kids. My wife and I have 2 beautiful girls but man… did people mislead us. We don’t regret having kids, but we should have waited a bit longer. Everyone has their own life to live. There isn’t one formula for everyone.